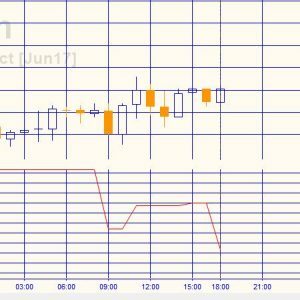 TradeStation have a standard indicator for plotting the ATR which uses the data for the chart for which it is applied. 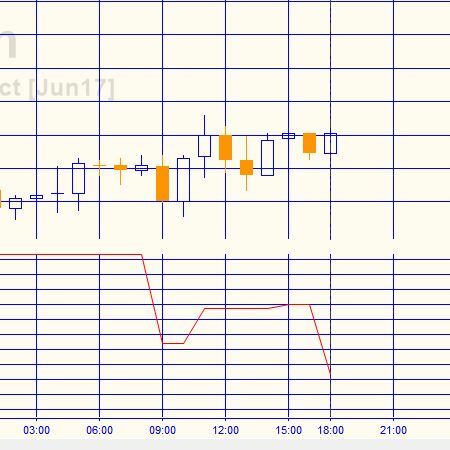 However, what if you wished to calculate the ATR of daily bars and plot it on a 5 minute chart? It would be relatively straightforward to use data from the current chart, however this tutorial explains how to do the calculation using the price series provider (PSP) class. This has several advantages including using settlement prices and the ability to be easily modified to allow a different symbol or bar length to be used. The following screen shot shows the tutorial applied to a 5 minute Google chart. The Average True Range (ATR) is a measure of volatility originally developed by J. Welles Wilder and is featured in his book: New Concepts in Technical Trading Systems. The true range (TR) for each bar is calculated. This is the difference between the ‘true high’ and the ‘true low.’ The ‘true high’ is the greater of this bar’s high and the last bar’s close. The ‘true low’ is the lesser of this bar’s low and the last bar’s close. The ATR is the simple average of the true range values. The following screen shot is of the regular TradeStation Average True Range indicator applied to a daily Google chart. The indicator calculates all the historic bars and then begins real time updates for the ‘real-time’ bars, i.e. the once that have developed since the program was activated or applied to the chart. For indicators, showme studies and paintbar studies the program runs once per bar for historic bars. For real time bars, it runs every tick. This real time update can be seen on this chart. Notice that at 15:00 the horizontal line adjusts upward. If you wish to save yourself some time typing in the code, the UNPROTECTED TradeStation indicator (_Tutorial120) containing tutorial program (i.e. the TradeStation EasyLanguage is fully functional and you can see the source code) is available for IMMEDIATE download for $19.95- by clicking the ‘add to cart’ button. The program works with TradeStation but not with Multicharts.